Normally, I don’t really like lunch meat, because it often has shady ingredients. Autolyzed yeast extract? Organic corn syrup solids? “Contains wheat” ??? However, Diestel Organic Turkey Breast is the best-tasting packaged lunch meat I’ve ever had, and the ingredients are the cleanest I’ve ever seen. I wish I could get it on the East Coast, but no dice. I would eat this every day if I could. If you’re on the west coast, I’d stock up on it! Because the game keeps changing, there is no way to have a truly perfect diet, or a truly perfect life. It’s a moving target, which means you have to keep adjusting your aim. The way to keep making your diet (as well as your life) better is to do more stuff that makes you feel good in the long run and do less stuff that makes you feel bad in the long run. If you can’t tell what makes you feel good and what makes you feel bad, keep a journal and track what you eat, what you do, and how you feel. Look for patterns. Do you have more or less energy? Are you happier or sadder? Is life better or worse? It is always a good idea to consult with a trusted medical doctor and tell her what you have in mind, and what you’re trying to accomplish. If you can only do one thing to get closer to what you want to achieve health-wise, I’d say cut down or eliminate added sugar to your diet. Here’s a great list of how sugar is ruining your health (references are at the bottom). I found a replacement that works for these discontinued replacement heads! The heads fit onto the stem of the Casabella dishwashing brush, and they’re cheaper than what Casabella used to charge!!! I’ve used the heads now for over a month (and I do dishes at least a few times a day), and they’ve been great! The replacement heads / refills are the Munchkin 2-piece Shine Stainless Steel bottle brush refills. They sell on Amazon for $4.49 for two (cheaper than one of the Casabella ones used to be!). I’ve shown the two brushes below, so you can see the Casabella (green) one is much longer than the Munchkin. For me, I need the length to wash bottles that are bigger. But I ordered the full bottle brush from Munchkin, just in case the replacement heads didn’t fit, so I would still be able to use the new brush. Now, you don’t have to! The Casabella brush is all gross in the photo because I’ve just been using it to scrub really dirty pots and pans before I wash them – I couldn’t bear to get rid of it until I found a replacement. They have a similar-enough screw-on base to work! This is the way the Munchkin refill fits on the Casabella stem. Seems like people like to see what’s going on with my avocado tree, Xavier. Here he is, September 24, 2016. I didn’t see buds this year, but he seems healthy and strong. I know we are going to see major leaf drop this fall, like we always do! Hi folks! Wow, it’s been a long time since I posted here. I hope I remember how to use WordPress (I’m kind of a Tumblr person now). Anyway, I’ve received so many comments and questions about how to care for avocado trees, that I wanted to post the results of how extreme trimming of my tree Xavier went last year. This is how Xavier looked on January 13, 2015, right before I pruned him. This is how extreme the pruning was. I am not an expert on plants or anything, but I have had great luck with Xavier and many of the plants I have, so I decided to give it a try. I was careful to prune with my clean Felco Pruning Shears to make good cuts. (I clean the shears with rubbing alcohol after every trim – I can’t tell you whether that’s a good thing for the shears or not – only Felco knows for sure, but that’s what I do.) I didn’t water him very much at all during this time before the leaves grew back, because I felt he was dormant. It took many weeks for leaves to grow back, but they grew back abundantly, just as when Xavier was healthiest! I am proud to report that Xavier looks great. I just took this photo today (January 31, 2016). You can see Xavier is a lot healthier this winter than he was last winter. Sure, there are some brown leaves, and there’s been a bit of seasonal leaf-drop, but still! Just look at my guy here! I didn’t add any fertilizer or compost this year, either. Just water! If you’re trying to eat gluten-free, be careful with breads and baked goods because a lot of the time, grains are replaced by starches and they are very carb-heavy and you just end up trading one problem for another. The Canyon Bakehouse bread is a nice, tasty treat, but a bit carby/starchy, as most gluten-free baked goods are, because most use starches to replace the grains that have gluten in them. So, this isn’t the kind of bread I’d eat every day or anything. 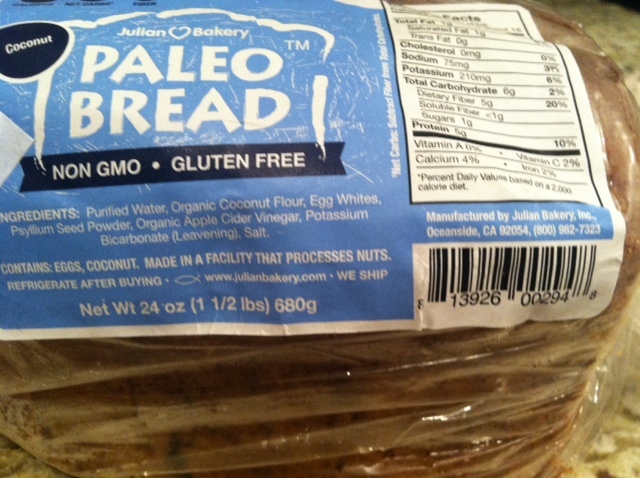 The Paleo Bread is low carb (because it’s not starchy), is moist, has a fairly strong baking soda taste (which is well-tempered if you eat it with something, as opposed to eating it with nothing on it), and really needs to be toasted, IMHO. The Coconut “flavor” does not taste like coconut at all to me. It just doesn’t have any nuts (as opposed to the Almond one), and is made with coconut flour. It is sold as a frozen bread, so I let half a loaf thaw out at a time in the fridge. If you try to toast a frozen piece, it takes forever, and will likely be unsuccessful. Even thawed, I don’t usually crisp it up like regular toast in the toaster, it just kind of gets warm. I like it moist for sandwiches. My diet-twin and BFF Joe B. (hi, JOE!) says he likes to put the slices in the oven for 15 min at 350. I don’t know if that’s frozen or thawed, though. If you’re looking for a grain-free, gluten-free, low carb, fairly low-sodium bread (that is also yeast-free, starch-free, soy free, GMO free, and nut free), Coconut Paleo Bread is the one! I love Wrapsacks, the 100% cotton, reusable giftbags. The thing I like the most about them is the website where you can track where your wrapsack goes, because there is a unique ID code in each one. The recipient will need to enter that code into the website in order for it to be tracked. I love the idea in theory so much, but in reality, I gave away a total of nine gifts in wrapsacks, and only 3 were passed along (and tracked). And none of those three were tracked after that. If you’re looking for recycled paper gift wrap, I only found one that was both recycled, AND was made in America. The brand that I found was called Waste Not Paper, and not only was it 100% recycled (30% PCW – Post Consumer Waste), and made in America, but it also seems like a good company, doing things right (see their “green story).” I found it at The Container Store.